You may not have ever heard of National Facial Protection Month before. However, this is a very real thing and it’s celebrated throughout this fourth month of the year: April! In short, what you need to know is that there are a variety of factors that can result in facial trauma. Once they occur, individuals often require the help of a dentist or oral surgeon to make things better because much of your facial structure includes oral tissues like your jaw and your teeth. During this month, we like to remind you and your family how to make sure everyone stays nice and safe with some simple tips! Active family members should wear athletic mouthguards to prevent facial trauma, to stop teeth from becoming knocked out, and more. So, what does active mean? It means if your kids are involved in sports, Mom or Dad is involved in sports, or you even take part in something very active individually (maybe you’re serious about lifting weights), taking the time to protect your smiles with these devices. We can help you figure out which is the best fit for yourself, your spouse, and your kids. 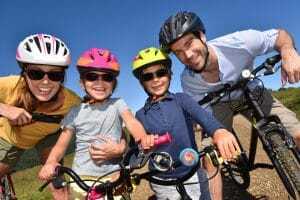 Everyone in your family should wear a helmet every time it’s an accessory you need for the selected sport or activity. That means even if you’re just hopping onto your bike to show your child how to ride up and down a path, you should both wear helmets. When everyone wears helmets when you’re going to be on wheels of any kind, when you’re at the batting cages, and the list goes on, you set the stage for major protection. It’s an easy yet powerful means of avoiding facial trauma and other injuries. It can save your face as well as your life! We offer suggestions, care tips, and services to ensure your entire family enjoys very healthy, safe smiles. Find out if you’re making good choices by scheduling a visit with your Ankeny, IA dentist today! Contact Peddicord Family Dentistry to set up an appointment by calling 515-963-3339. Bruxism: Skip All Of The Confusion! Smile Discoloration: Remember These Facts!